This week the tears of the tupuna freely flowed. We felt their presence as we climbed the Parapara mountain range from Riuwaka to Pohara. We saw their stories in the carved pouwhenua of Manawhenua ki Mohua. We slept soundly in the beautiful whare at Onetahua Marae, Te Ao Marama. And then when we walked the track to the waters of Te Waikoropūpū we knew the strength of Wai Ora as the purest form of freshwater. Waters used for cleansing and spiritual healing. The water of life. Our mission, as a team, was to travel to the northern most point of Te Waipounamu, to promote Wave Six and to meet the people, to visit their special spaces, to be available for kōrero, to visit our entities. It was the most amazing week. What’s not to love about Pohara where the sea touches the sky, and it felt like summer had never left?. We visited the Kokiri – where Te Ataarangi classes are held – we walked to the beach – we stopped and breathed the fresh air all around us. 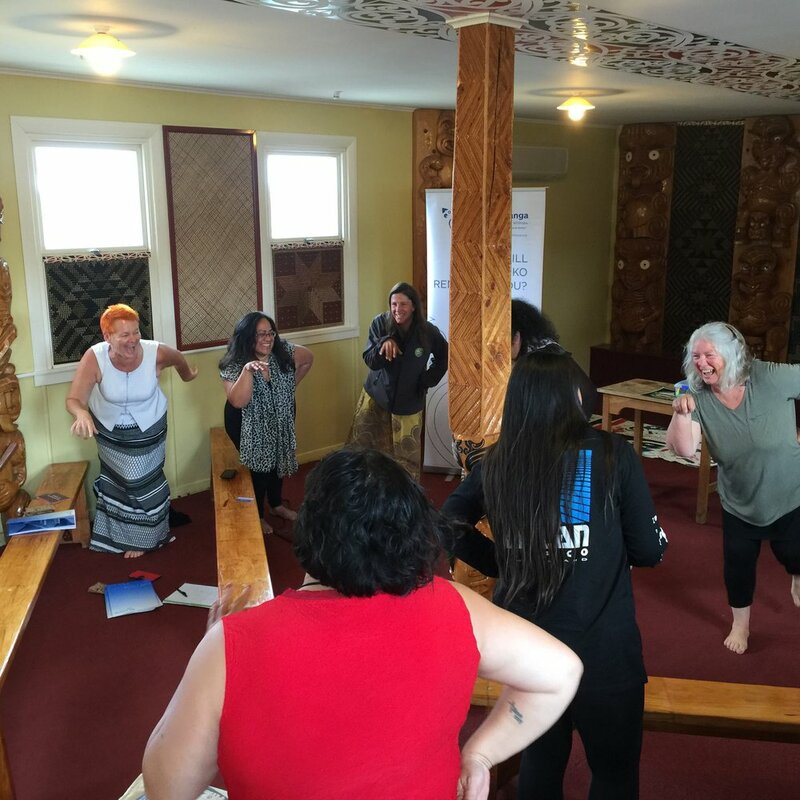 We also put Ngā Muka to work at Te Āwhina Marae in Motueka where the team from Te Ataarangi came together to share a sample lesson with us. We had an hilarious hour putting actions to our kupu…..now that’s a fun way to learn te reo! It was great to see the work that has evolved over years in murals that have been created to share the experiences of the people. Ngā Muka is designed to energise and maintain reo speaking communities in areas of Te Tauihu that might otherwise experience barriers to learning, celebrating and championing te reo rangatira. Thanks to Chrissy Piper, Telesia and the team for a great day. Our original plan had been to go out on the waka with Waka Abel Tasman but Tawhirimatea had other plans for us. Waka Abel Tasman was the first New Zealand waka business to be externally audited under Adventure Act regulations and is a certified adventure company. They put a very high value on safety – something that Te Pūtahitanga o Te Waipounamu recognized when we funded them over the last nine months. We couldn’t go for a paddle but it was great to hear all about their passion for the waka as a vehicle for learning. The waka is a vehicle for connection – whether it be the Special Education Unit at the high school, twelve kaumātua from Te Āwhina Marae, whānau, kura, kaimahi. A wonderful way to come together, at one on the sea. Not long ago there were three generations in the waka – the life-jackets start at one year old! Not to be outdone by her mokopuna an eighty year old kuia was recently pride of place in the waka. For over sixteen years they have been working with Whakatū Incorporation to bring whānau together. The beautiful thing about Leanne and Todd Jago’s initiative is that they are truly working with the mana whenua to make it an indigenous experience. They talk about Kakapa Point –the traditional pa site and urupā. Tribute is given to Te Tai o Aorere - their waka is named Tara-ki-uta; Tara-ki-tai. Following our time at Mōhua, we had a wonderful dinner overlooking endless ocean at the Boathouse. It was a great night which gave an opportunity for three of our Nelson based entities to showcase what it is that they do. The catering was taken care of by the magnificent Angels Trio, who treated us to raw fish, shrimp cocktail, steak and stunning service. Julie Ruawai from Waka Whenua shared her dream that one day, the tikanga of burying the whenua (placenta) will be an openly celebrated global practice. And the whānau from Ngāti Kuia kept us all engrossed in their initiative to connect and reconnect whānau to their lands and to engage with descendants of the land. The key objective is to assist whānau who want to develop their lands for cultural, social, or commercial purposes. If the first few days of the week were pretty full on, the tempo didn’t let up! On Wednesday our navigators met up in Nelson together, and then on Thursday I was off to Invercargill with Pari, Vania and Serena to meet up with all our initiatives, entities and navigators at the Ascot Hotel. We had a fabulous turnout: Koha Kai; Hokonui; Tuatapere, Lumsden, Otautau, Rangatahi Tumeke, Try-Whānau, 1000 Days Trust, Awarua Whānau Services, Ngā Kete Mātauranga, Forest Pharmacy. Joyce Manahi talking about Try Whānau and its impact with whānau. This week, an amazing gathering of entrepreneurs and enterprises came together with Unleash the Māui. We had some great talent on display from Te Pūtahitanga initiatives: Digital Natives Aotearoa; Puha Pesto; Whenua Kura; Manaaki (Omaka Marae); Kākano Café and Cookery School and of course the blight-free, virus-free potatoes that are the pride and joy of Koukourārata. We were spoilt for choice with all our Whānau Enterprise Coaches also in the house. While he was in town, the Minister for Whānau Ora, Te Ururoa Flavell, also made a priority of catching up with He Waka Tapu, Te Pūtahitanga o Te Waipounamu, Te Whare Hauora and Te Puna Oranga – the consortium that makes up Tū Pono. We had a solid couple of hours with the Minister as we talked through our experience with the Integrated Safety Response model, Tāne Ora, working in a whānau-centred way, and under-reporting of data. It was great to have our new Whānau Ora Navigator Champion, Ariana Ngaruhe join us, as well as Abbey Namana and Malcolm Pitman from Te Maataa Waka o Te Tauihu (Blenheim). Michelle Hemi, Minister Flavell and Ariana Mataki-Wilson. Finally, as Canterburians register for Pae Ora : the City to Surf event this weekend, this story from the far South came in to get us all inspired. Mike Conway and his grandson Keanu Wanakore-Conway, almost 3. Mike Conway has switched pies for crackers and dropped 5% of his body weight. It wasn’t long ago the 45-year-old father-of-three thought he was in pretty good shape. But as he watched his young moko kicking a ball around he thought I’d like to be able to run around with him and kick it back. So between his moko and the rest of his whanau Mike decided to give the Biggest Loser Challenge a go. Keen to reach a higher level of fitness, Mike started walking and lifting weights, and replaced pies and mousetraps with crackers, raisins and cranberries and halved his portion sizes. It’s about healthy choices rather than convenience, he says, although a trip to the supermarket takes a bit longer. Mike, who enjoys diving, fishing and watching sport, is loving the challenge and says it’s great to see the cross section of ages, ability and fitness levels doing the hard yards. He has noticed a big change within his whanau.